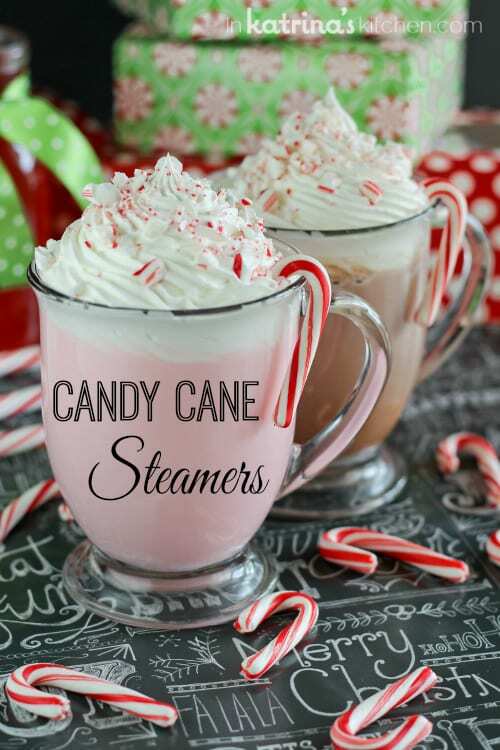 Sweet enough for kids, flavorful enough for adults, everyone will love these Candy Cane Steamers. Enjoy this perfectly festive peppermint drink alongside your favorite holiday cookie today! I am happy to partner with the American Dairy Association Mideast to help Feed America! Together we can make a difference. The whole ritual of making a cup of coffee is relaxing to me. I could care less if it is regular or decaf. Just let me add an obscene amount of milk or flavored creamer and some sugar. Sometimes at night I want to be holding a warm mug in my hands but I want to be able to go to sleep in a few hours so I enjoy homemade steamers. Steamers are essentially steamed, frothy milk with a few Tablespoons of flavor. 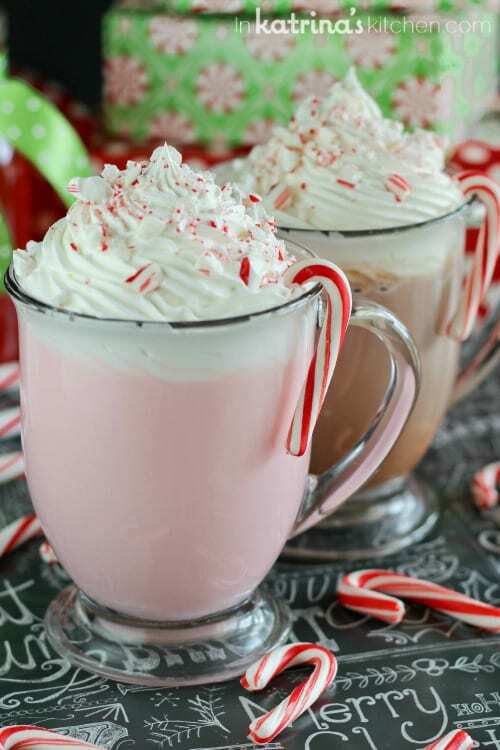 These candy cane steamers are perfect for the holidays and you can make everything at home (including the 2 ingredient Candy Cane Syrup!). Make yours with white milk or indulge in a little peppermint mocha steamer and switch things up by using chocolate milk. Traditionally I have enjoyed these with purchased peppermint flavored syrup but I have been making my own simple syrups recently and I think you’ll be surprised with how easy it it to make at home. You can follow my 2 Ingredient Candy Cane Syrup recipe or run to your local coffee shop and pick up some peppermint syrup. Not only are you avoiding caffeine by enjoying a homemade Candy Cane Steamer but you are also getting a whole serving of dairy. And dairy foods are a tasty, convenient and cost-effective way to power up with protein. On average, one serving of milk, cheese or yogurt provides eight grams of high quality protein. Today, more than 50 million people in America are food insecure. Of these, nearly 17 million (one in five) are children. Feeding America can provide nine meals for each dollar donated. 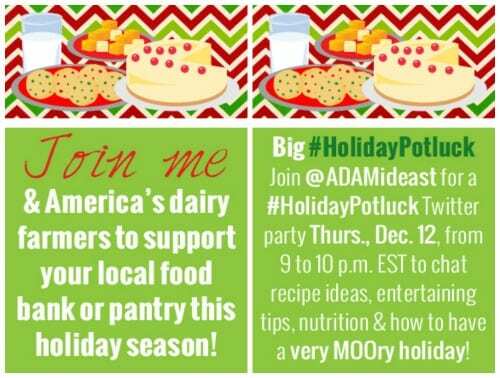 The American Dairy Association Mideast has partnered with 12 food bloggers from throughout the country to prepare a “Big Holiday Potluck,” and ADA Mideast will donate $1 to Feeding America for every “like,” comment or share each of the bloggers’ 12 recipes receive on its Facebook page between Dec. 6 and 13. Tis the season for giving- and this is such an EASY way to give- just one click and a little “thumbs up” like is all you need to do to show your support! Heat milk in the microwave for 60 seconds, stir. Return to the microwave for 15 seconds if necessary. Add 2 Tablespoons of Candy Cane Syrup. Using a handheld milk frother, froth warm milk for 10-15 seconds (optional). I love this handheld frother and recommend it highly. 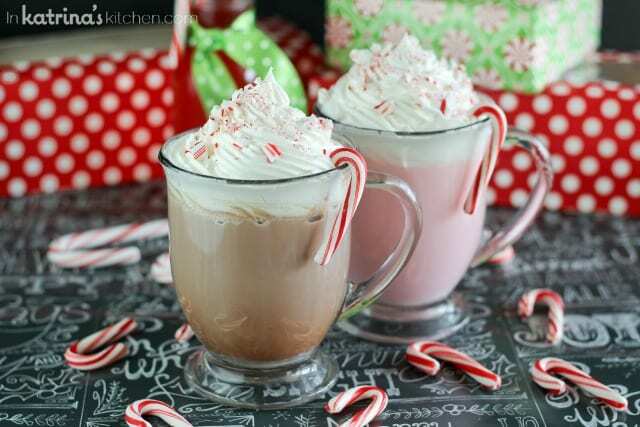 Use chocolate milk to make a tasty Mocha Candy Cane Steamer. I own and use this handheld frother almost every day- I LOVE it. 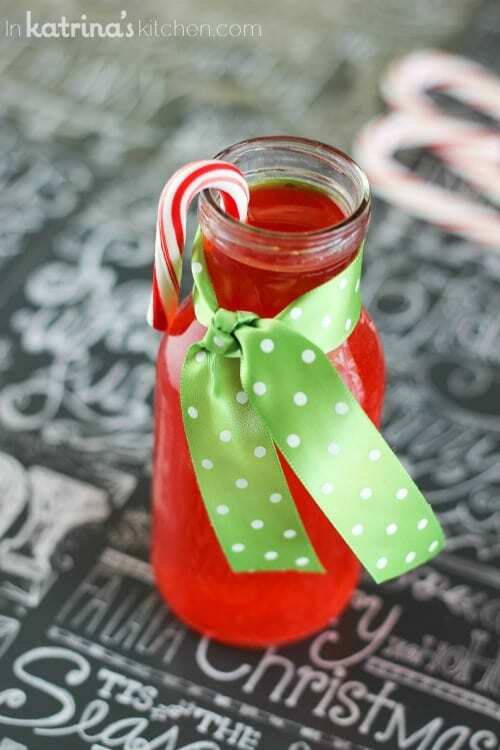 And although I used my homemade Candy Cane Syrup I’m including the link here for peppermint syrup from Torani. You can order it online or find it seasonally at World Market, coffee shops, and some grocery stores. Thanks Laura! I love a warm drink on a cold night. Oh yum, yum, yum and looks so easy. The kids (and parents) will totally love these. Yep! Our kids enjoyed a sweet peppermint twist in their hot cocoa. Mmmmm love these! So Christmasy! Thanks Kayle. I do love a festive Christmasy treat! Thank you Sheila- you are so sweet! Katrina’ I’m the exact same way–love coffee and sipping something warm, but still need to be asleep at a reasonable hour. This looks like such a fun update to my traditional nightly hot chocolate. Cheers! It was so good in the hot chocolate! Mmm now I want another cup tonight! Oh, my gosh I just love these!! Gorgeous photos girl!!! !